Rivo Casino is no longer available . Click here for alternative casinos . Spin the reels of some of the best online slots at Rivo Casino. Home to a huge library of Novomatic games like Book of Ra and Sizzling Hot, this dynamic casino offers instant play, as well as mobile games. Also, new players can take advantage of a no deposit bonus. Rivo Casino is definitely worth checking out, especially if you’re someone who happens to be a lover of Novomatic games. 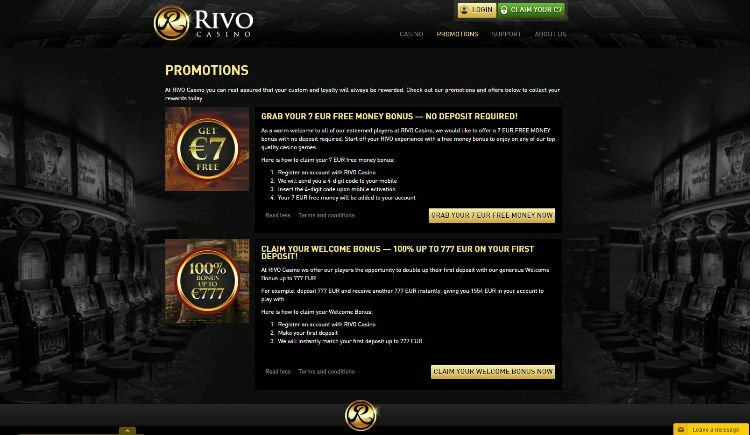 Offering a welcome promotion for new players and other rewards, what you’ll discover in this Rivo Casino review is that there are many bonuses that you can enjoy if you choose to join the casino party at this iGaming destination. 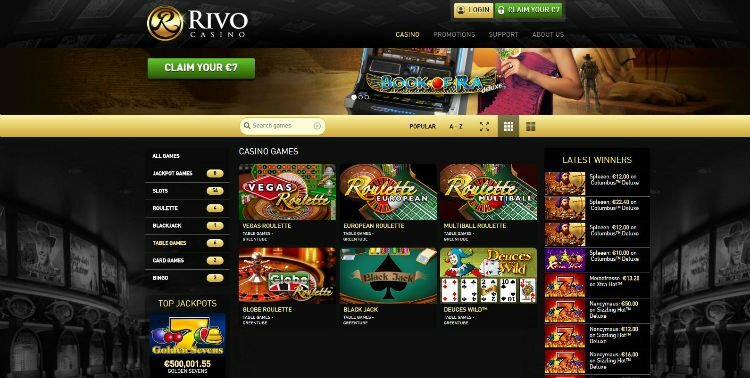 The first impression that you might get when you visit rivocasino.com is that the online casino combines a classic style with a modern edge. The design is crisp and elegant, making the site user-friendly and easy to navigate. It will no doubt appeal to novice players and pro players alike. As for Rivo Casino software, Novomatic is behind the high-quality content you’ll enjoy at this internet gambling playground. It offers many delightful casino games with incredible graphics, sounds and themes. However, among the most popular Rivo casino games you’ll find include the slots Book of Ra, Sizzling Hot and Lucky Lady’s Charm. 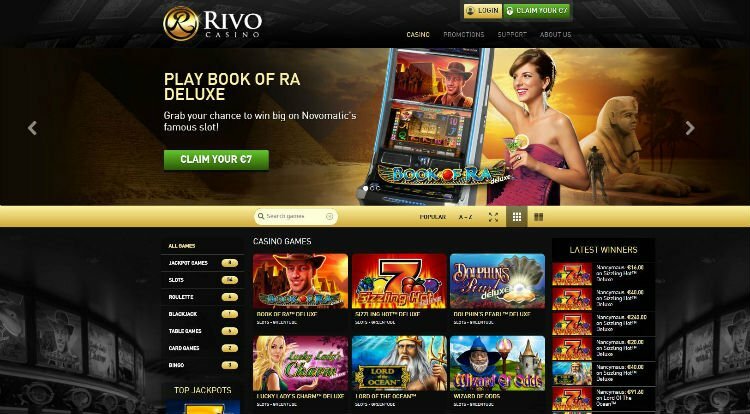 A great bonus is that RivoCasino offers its games via an instant play platform, which means that players will get to play top slots like the Indiana Jones-based Book of Ra, 5-reel multiline slot, with no download required. Do you enjoy playing casino games on your smartphone or tablet device? Then you’ll love Rivo mobile casino. Simply signup and access a full range of games via your compatible iOS or Android powered mobile device. Rivo promotions are available for both new and existing members. As part of its welcome bonus, new players are offered a free €7 no deposit credit to play with. This means all you need to do is register a new account and you are given free money to enjoy real money gambling entertainment. This is a great way to start your rewarding experience. Just remember to check out the terms and condition and keep in mind that you’ll need to use the proper bonus code to take advantage of the offer. Discover a wide selection of Rivo payment methods that include, among others, Visa, MasterCard, Neteller, Moneybookers and more. There are multiple secure deposit options from which to choose. Rivo online casino customer support is readily available and can be reached via live chat and through email at support@rivocasino.com. They also offer an FAQ page, which is helpful for anyone looking for answers to common questions. Overall, Rivo Casino is a great place to play. The only major downside is that several countries are restricted.